BLOG: Do we still need to order fluorescein angiographies? I recently helped give a workshop on fundus fluorescein angiography, and I spent a fair amount of the introduction trying to prove to the audience that this was still a necessary procedure. And while I do think we should keep performing FFAs in some cases, the question of its usefulness is an important one, and one that we’ll dive into this month. 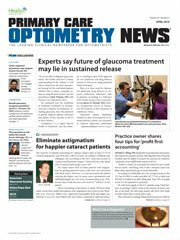 Optical coherence tomography (OCT) has become standard of care – and rightfully so – in practices that manage posterior segment disease, and there are many things that OCT does better than fundus fluorescein angiography (FFA). But there are things that FFA can do better than OCT.
OCT shows anatomy particularly well but has a poor ability to show perfusion. FFA can show how a tissue is being perfused, when it receives perfusion, how well and in what pattern. These findings are still better than spectral domain OCT to diagnose capillary nonperfusion and macular ischemia, for example, in diabetic retinopathy. There are anatomical ways to diagnose neovascularization elsewhere with the OCT; one can look for surface proliferation into the vitreous, for example. But the neovascularization could be inactive yet still present. An FFA would tell the clinician if those vessels are actively leaking and by what amount. It’s a similar situation for choroidal neovascular membrane (CNVM); we usually look for subretinal fluid (SRF) on the OCT. But if we used an FFA, we could determine if the fluid is new or chronic and we could better differentiate the causes of the fluid, like central serous, which may have a different treatment. There are also FFA findings in Stargardt’s disease or the many white dot syndromes that help differentiate one from another, which can sometimes dramatically change the management of the disease. In our retina clinic at the hospital, we see a lot of macular degeneration. And it’s still standard of care here to perform an FFA (unless otherwise contraindicated) on a patient before his first anti-VEGF injection for a CNVM. We’re looking for clues if the condition (which looks like CNVM on OCT) could indeed be anything else. And from a disease management position as well as a legal position, these clues are best looked for before treatment is started. OCT gives us anatomic clues, which are vastly important and often can make the diagnosis alone, but FFA gives us perfusion clues, which sometimes can reveal things the anatomy can’t. But what if there were an anatomical way to check perfusion? New technology is hitting the market: OCTA, or OCT angiography. OCTA is a noninvasive way to analyze retinal vasculature. It works on the premise that (if you can correct for patient movement, which gaze-tracking software can mostly do) the retinal anatomy is static and, thus, the only thing moving during scans would be blood flow through vasculature. 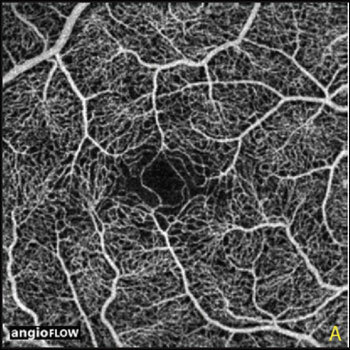 Thus, the software can plot out the location of every branch of the vasculature, including the tiny retinal capillary beds. This technology is pretty impressive, but it does have its pros and cons. Big plusses for the technology are the speed of image acquisition (6 to 10 seconds per image vs. 10 to 15 minutes for FFA) and the lack of intravenous dye injection. Also, OCTA renders retinal capillary detail much better than the traditional “flush” of FFA images, and localization of the depth of any lesion is easy with OCTA. Source: Talisa E. de Carlo et al. However, like any technology there are some drawbacks. OCTA works best with relatively fast blood flow, since it’s easier to detect that change from a static retinal landmark. Thus, for situations with slow blood flow, like the oozing of a central serous blister or the gradual pooling of a CNVM, OCTA is less helpful. In general, to detect dye pooling and late-stage leakage, FFA technology is still tops. And keep in mind that these are the conditions for which many FFAs are ordered. But, still, an OCTA could delineate the abnormal vessels of a CNVM, and a regular SD-OCT could show how much SRF there was. The new OCTA technology has a big potential to change the way we detect retinal and choroidal disease. Especially with diabetic retinopathy, areas of capillary nonperfusion (CNP) could be detected far earlier than we are typically doing so, and we could do more careful, focused monitoring for neovascularization. I think CNP is far more common in long-term diabetics (even those without much retinopathy) than we might think, and OCTA would be able to test that hypothesis on a large scale. Also, OCTA would make it much easier to determine whether or not a retinal vein occlusion is ischemic. Despite the technological advances of SD-OCT, there are still conditions for which we need to see perfusion and leakage in ocular tissues, not just anatomy. For this reason, FFA is still a vital test for our patients. But OCTA is an interesting development for our practices, and time will tell how this test is adopted by our peers. If anyone has any comments regarding their own experience with OCTA, please leave a comment on the site; I’d love to read your opinions. BLOG: How does anemia cause retinopathy? BLOG: How do eplerenone and spironolactone treat CSCR?